At Cineworld Boldon Tyne and Wear you can enjoy all the latest blockbusters. 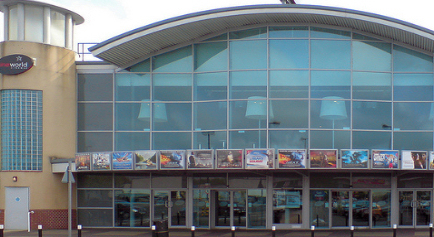 A selection of snacks are available, the cinema is located on Boldon Leisure Park. Ample car parking spaces and a location adjacent to Asda Supermarket makes Boldon Leisure Park a regular favourite with both cinema and restaurant goers, perfect for any customer. You can enjoy a meal at Pizza Hut or Frankie and Benny’s after your movie. Our cinema times are updated every day and you can click to book direct with the Cinema. Take the A19 road head towards the Tyne Tunnel, turn right onto the A184, proceed for 300 Metres, at the mini roundabout, turn left and proceed into the Leisure Park. Take the A19 through the Tyne Tunnel, turn left onto the A184, proceed for 300 Metres at the mini roundabout, turn left and proceed into the Leisure Park.